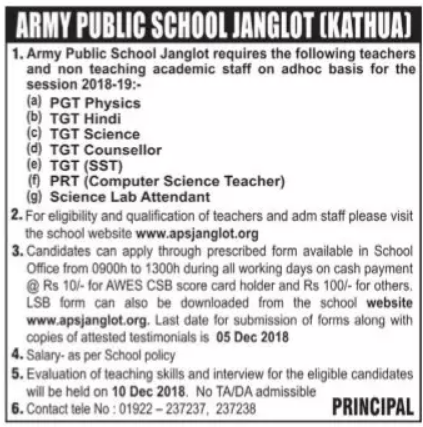 Army Public School, Janglot has advertised for recruitment of Teaching Faculty- Teachers PGT / TGT / PRT jobs vacancies. Interested and eligible job aspirants are requested to apply on or before 05th December 2018. Check out further more details below. About School: The school was founded in Jan 1988 as Ridge View School Janglot which was a garrison school run by Bde HQ. Orders for converting this school to Army School Janglot were received during the month of Jul 91. Since academic session was in progress, it was decided by the Managing Committee to bifurcate it into Army School Janglot and Ridge View School (for Nursery/KG sections) from the academic session 1992-93. As per CBSE norms. Visit official website for more details. How to Apply: Interested and eligible candidates are requested to read below for apply process.